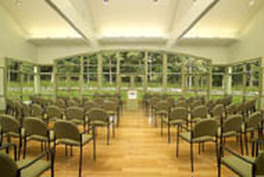 Past Programs - Wellesley Conservation Council, Inc. Since the arrival of the Pilgrims, the Massachusetts landscape has been subjected to cycles of dramatic change, and each has had its impact on birds and wildlife populations. Recently, accelerating industrial and residential development and advancing climate change have made it more urgent to preserve open land and wildlife habitat while making selection of conservation targets more complex. Mass Audubon has long been a regional leader in open-land conservation in the Commonwealth. In this program, Mass Audubon President Henry Tepper described the history of conservation in Massachusetts. Henry then assessed the current state of land conservation and showed how conservation organizations can work with local government to rehabilitate, enhance, and preserve natural environments. John Maguranis presented a PowerPoint program on Eastern Coyotes. His program addressed coyote origin and history, natural behavior and habits, myths and facts, and identification and tracking, as well as issues of pet and human safety. John discussed the benefits of coyotes in controlling rodent populations and thereby reducing the incidents of Lyme Disease ticks, which require rodents as part of their life cycle. He described why coyotes eradication programs have always failed, and demonstrated “Coyote Hazing,” a powerful tool for keeping coyotes at a distance by reinforcing the animal’s natural wariness of people. The program was well attended and included a lively dialog with some audience members who did not share John’s enthusiasm for coyotes. Throughout the program Wellesley Animal Control Officer Sue Webb, joined John in addressing questions about coyotes in general as well as their presence and behavior in Wellesley. With bitter cold, dense fog, heavy snow, and record winds, 6288-foot Mount Washington is New England’s highest peak and is known for unpredictable and dangerous weather. But why, for a mountain its size, does Mount Washington actually see the World’s Worst Weather? Mount Washington Observatory's Will Broussard delivered a hands-on session multimedia session focusing on the unique weather at the summit of Mount Washington and the weather observers who work at the observatory year-round. The program combined interactive demonstrations, weather instruments, images, and video footage to bring the Mount Washington summit here to Wellesley. Despite heavy competition from the final game of the World Series, some 60 people came to hear and see the program. 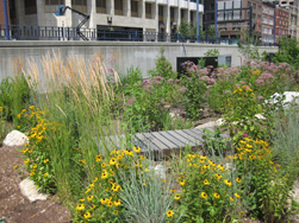 Peter Hinrichs delivered a PowerPoint slide presentation, "Rain Gardens: Finding the Balance." Mr. Hinrichs explored the handling of storm water on a residential landscape scale and offered creative solutions for finding the balance between the designed and natural environment. He reviewed design options, construction details, maintenance and plant selection for a rain garden. 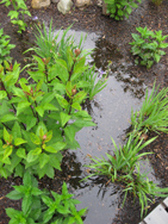 Because water is a precious resource, many people have become interested in rain gardens. These specially constructed gardens can absorb rain water collected from roofs, buildings, and roads. They have a 30% greater capacity to soak up water than a standard lawn while also filtering storm runoffs before they reach ponds, lakes, or rivers. At ten years old, Peter Hinrichs began pulling weeds and tending perennial gardens. This led to his maintaining the grounds of an apartment complex. After apprenticing at a landscape design firm in New Hampshire, he majored in landscape architecture at the University of Massachusetts. Mr. Hinrichs' career has been shaped by his belief in the value of well-designed landscapes. He currently works as a Horticultural Specialist at the Learning Prep School in Newton, MA and is the owner of dig in it!, an organic and sustainable landscape design and construction company. Peter Mirick, wildlife biologist with the Massachusetts Division of Fisheries & Wildlife, explained the basic role of snakes in the environment, the adaptations they all share in a legless body and the many differences between species in terms of habits, adaptations and evolution. He also introduced current conservation concerns regarding our native snakes and how those concerns are being addressed with research and restoration activities. Mr. Mirick mentioned the needless fears many people have about snakes. He shared photos and information to enable identification all 14 native species when encountered in the wild. Mr. Mirick brought a very beautiful, tame (non-biting, calm) Red Ratsnake (aka “Corn Snake,” native from New Jersey south to Florida) that children and adults could handle in perfect safety. 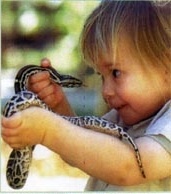 Mr. Mirick has been interested in snakes and herpetology (the study of reptiles and amphibians) since early childhood. He earned a B.A. in Biology from Hartwick College in Oneonta, NY and a M.S. in Biology from Worcester State University. He did additional post graduate work at Iowa State University. He was always torn between biology and writing as a career. He has been a Wildlife Biologist with the Massachusetts Division of Fisheries & Wildlife for 35 years, and has worked in virtually every aspect of fisheries and wildlife management. 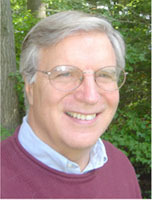 Peter has been the editor of Massachusetts Wildlife magazine since 1981. 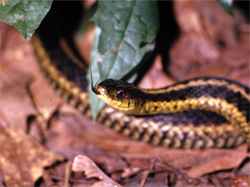 He has conducted a radio-telemetry research project on a population of eastern rat snakes (a Massachusetts-listed Endangered Species) since 1998, and has been involved in many other reptile and amphibian conservation projects. Warren Leach delivered slide presentation Gardening Towards Creating Sustainable Landscapes. A landscape designer and horticulturist, Mr. Leach explored design themes for sustainable landscapes. He is a co-owner of Tranquil Lake Nursery in Rehoboth, MA. A sustainable landscape is both visually pleasing as well as environmentally friendly. Sustainable planting design reduces the need for plant maintenance by using minimum amounts of fertilizers, pesticides, energy, water, and time. Mr. Leach addressed plants and planting combinations that make up an environmentally friendly garden. He highlighted landscapes that embrace that paradigm, and showed before and after images of their creation. Sustainable landscapes actively contribute to a healthy environment. They use innovative planting and design to clean the air, soil and water while restoring natural habitats for animals and plants. Warren Leach is a prominent grower of day lilies, iris, distinctive perennials, and woody plants. He is a passionate plant collector, nurseryman, horticulturist, and landscape designer. Over the last 25 years, Warren has created beautiful landscapes throughout New England and made educational display gardens at Tranquil Lake Nursery. His awards and honors are numerous. 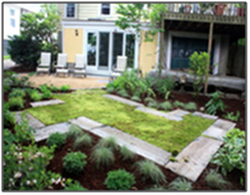 He has twice received the National Landscape Association Regional Certificate of Merit for Residential Landscape Design. 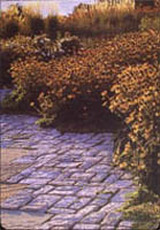 In 2009 the Rhode Island Nursery and landscape Association awarded him with the First Place Award for Residential Design. The Massachusetts Horticulture Society honored him in 2010 with the Gold Medal for his horticultural expertise in creating exceptional displays for the New England Flower Show. 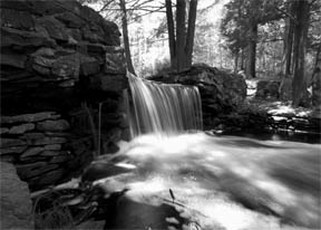 Images of Warren’s garden design at Brigham Hill Farm, North Grafton, MA are archived at the Smithsonian Institution in Washington, D.C.
Tom Ricardi's conservation education program described the world of raptors in general and introduced several live birds of prey including an eagle, a falcon, an owl, and a hawk. Birds of prey include some 292 species of daytime feeders is include falcons, hawks, eagles and vultures as well as a number of owl species that feed at night. 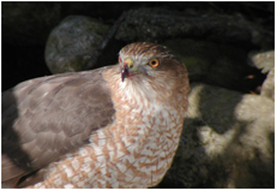 With sharp talons, hooked beaks and keen eyesight, birds of prey are immediately distinguishable from all other birds. These birds hunt for food primarily during their flight using their keen senses, especially superior eyesight. From the earliest times, birds of prey have occupied a special place in human feelings towards the natural world, symbolizing freedom, power and nobility. But because of the raptors need large undeveloped habitats there is concern for their survival. At the Massachusetts Bird of Prey Rehabilitation Facility in Conway, MA, Tom Ricardi has successfully bred and rehabilitated many of these raptors. This private, non-profit project’s function is the care and rehabilitation of birds of prey for eventual release back to the wild. Another function of the project is captive breeding in which permanently injured birds that cannot be released are used as breeding stock. Species such as bald eagles, kestrels and other falcons, barn owls, red-tailed hawks have produced offspring for the reintroduction to bolster the wild population. 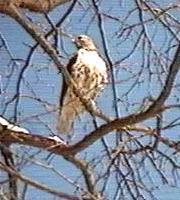 In April 1989, an eagle hatched at the Massachusetts Rehabilitation Facility was placed in a wild eagle’s nest at Quabbin Reservoir in hopes that the adult eagles would accept the chick as their own. They did and by August the young eagles had fledged. The fostered eagle found a mate and has successfully produced families of her own ever since. This was the first official report of a captive-bred eagle nesting in the wild. Spring 2011: The Baker Estate - "Fairyland of the Beautiful and Bizarre"
Gloria Polizzotti Greis, Executive Director of the Needham Historical Society delivered a powerpoint lecture The Baker Estate - "Fairyland of the Beautiful and Bizarre," She introduced the history of the Baker Estate and illustrated her lecture with the extensive collection of Baker Estate photos in the Needham Historical Society. Gloria Polizzotti Greis has been Executive Director of the Needham Historical Society since 2002. Prior to the Historical Society, she was Peabody Research Fellow at the Peabody Museum of Archaeology and Ethnology (Harvard) (2001-2002), and Collections Manager for the Peabody’s Archaeology and Human Osteology Collections (1989-2001). Ms. Greis holds a PhD in Anthropology, specializing in the archaeology of prehistoric Europe, and is the author of two books on archaeology, a book on local history, and several articles on history, archaeology and various other topics. She also serves as a member of the Needham Historical Commission, and the Needham Tercentennial Committee. WCC's Guernsey Sanctuary, a 25 acre woodland maintained in its natural state, is a part of the original Baker Estate. Guernsey Sanctuary was a gift to the Wellesley Conservation Council in 1961 by Mr. and Mrs. William G. Guernsey. Mike Francis presented the story of the Trustees of Reservations, an organization of 100,000 members from every corner of Massachusetts who love the outdoors and the distinctive charms of New England, and who believe in celebrating and protecting them for future generations. 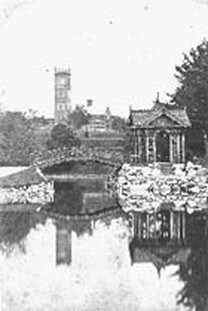 Since its founding in 1891 by Charles Eliot, an open space visionary and protege of the famous landscape architect Frederick Law Olmstead, The Trustees’ mission has been to preserve, protect and care for properties of exceptional scenic, historic, recreational and ecological value in Massachusetts. As land is being developed and open space is being fragmented at a rapid pace of an estimated 40 acres per day around the state, The Trustees are working to mobilize and inspire a critical mass of people and partners who care about quality of life in their communities and will work to protect and enjoy them. The Trustees of Reservations own and manage more than 100 reservations, all open to the public. Of these, 37 properties are in the greater Boston area including: working farms such as Powisset Farm in Dover and Moose Hill Farm in Sharon; tranquil woodlands such as Rocky Woods and Rocky Narrows in Medfield and Noanet Woodlands in Dover; formal gardens and historic homesteads such as the Bradley Estate in Canton and the Old Manse in Concord; and beautiful landscapes such as World’s End in Hingham. 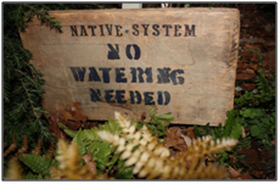 In addition to owning and caring for 100 reservations, consisting of nearly 25,000 acres in more than 70 communities, The Trustees hold conservation restrictions on more than 16,000 acres of privately owned land and have worked with communities and other conservation partners to assist in the protection of an additional 16,000 acres. The Trustees’ affiliate, Boston Natural Areas Network, owns 39 community gardens and advocates for urban wilds and greenways in the city of Boston. A member-, donor- and endowment-supported organization, The Trustees provide hundreds of year-round programs and events that inspire people of all ages to enjoy the outdoors and appreciate and care for natural, scenic, and cultural landscapes and landmarks across the Commonwealth. 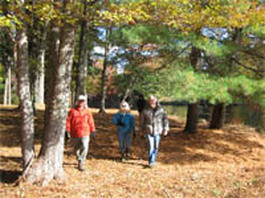 The Town of Wellesley Trails Committee maintains 26 miles of trails in Wellesley including trails on WCC properties, and maks trail maps and guides are available through their website. Mr. Rovick informed the audience about Wellesley’s extensive trail system. The many woodland and interconnecting trails are carefully maintained for safe walking and biking by the committee and volunteers. Marla Isaac presented a lecture and live reptile exhibit. Ms. Isaac brought live animals to exhibit and “pet”, as well as bones for viewing. “Attendees” included an alligator snapping turtle, a common snapping turtle, an alligator, a tortoise, and a box turtle. Topics covered included natural history, adaptation, habitat destruction, poaching, species exploitation and management of reptiles in their native habitat and in captivity. Ms. Isaac has been presenting wildlife shows and exhibits for over 30 years. Her experience includes handling, caring for and propagation of snakes, including the venomous rattlesnake, genus Crotalus. Ms. Isaac maintains a diverse collection of snakes, tortoises, turtles, lizards and crocodilians for research and educational programs. Marla Isaac's overriding interest is in the natural history and preservation of reptiles in the wild. Her programs are intended to promote greater public understanding, respect and “affection” for reptiles in their native habitat. Reptiles are one of the most misunderstood and feared groups in the animal kingdom. They are subject and victim of numerous tales, fables, myths, and movies. 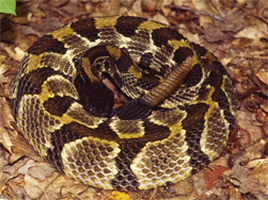 Bounty hunting of snakes in the past have led to their decline in the wild. 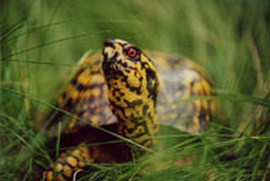 Amphibians and reptiles, like other wildlife, have also suffered from habitat destruction, as well as from poisoning by pesticides and other pollutants. Commercial collectors have contributed to population decline by harvesting wholesale numbers of reptiles to feed the market of pet stores and customers. Reptiles evolved from amphibian stock more than 315 millions years ago during the early Upper Carboniferous Period. Modern reptiles can be traced back to the Permian Era, 280 million years ago. Over 200 species and subspecies of reptiles are found in eastern and central North America, comprising 3 species of crocodilians, 53 species of turtles and tortoises, 96 species of lizards, and over 100 species of snakes. A sustainable landscape addresses the needs of the present community without negatively impacting the ability of future residents of the area to meet their needs. This lecture detailed the road we must take to restore our ecological systems. It addressed environmental awareness and sought to highlight innovative ways to use plant material to clean our air, soil and water, and predicted that the 21 st century will witness a new and exciting role for plants on the cutting edge of landscape restoration. Integrated environmentally-engineered systems are distinguished for their incisive design, their harmony of art and engineering. This approach promotes both the wise use of water resources and the genetic diversity of plant material. Heirloom and unusual varieties of herbs, vegetables, fruits and flowers, steeped in long histories, bind us to our past. To enable our plants to cope with future environmental stresses.we must strive to preserve their full range of genetic possibilities. 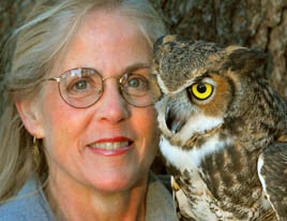 Mark and Marcia Wilson of Eyes On Owls delivered a slide-lecture program, “Who's Watching You? Owls of New England ” After a colorful slide program of photographs by well-known wildlife photographer Mark Wilson, and an interactive hooting lesson, Marcia introduced 6 live owls that have been found in New England. Everyone loves owls! Yet, how many of us have ever actually seen an owl in the wild? 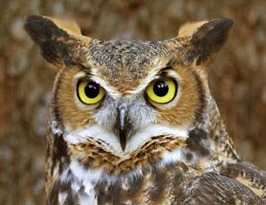 Perhaps you've glimpsed the shadowy form of a Great Horned Owl in the headlights as you traveled a back road at night. Ever scanned a frozen salt marsh or farmer's field in winter, hoping to find that arctic hunter, the Snowy Owl? How about a mob of noisy crows circling around a white pine tree – do they see an owl? Mark and Marcia introduced the audience to the owls on New England 's owl checklist. Some species, like the Great Gray Owl or the Northern Hawk Owl, are rare visitors. Others, such as the Great Horned Owls and Barred Owls, may be more common that you think. Mark and Marcia shared the field marks and naturalist skills that can be used to find owls without disturbing them, as they introduced several live owls up close. Marcia brought out the live owls one at a time. With each owl perched securely on her glove, she walked around the room. There was plenty of time for close-up views and lots of questions.The audience learned owls' calls, as well as tips on how to go out owling on their own. Each owl has a permanent disability that keeps it from surviving on its own in the wild. These non-releasable owls serve as captivating ambassadors from the world of wildlife. We are all concerned about how water resources will be impacted by climate change, and whether aging public infrastructure is affecting the quality and quantity of water in Wellesley. In this program,Peggy Sunshine of the CRWA, showed how the relationship between land and water resources are intricately connected. She described how CRWA's hydrologists, urban restoration planners, and environmental scientists are protecting fresh water resources in this region and beyond. 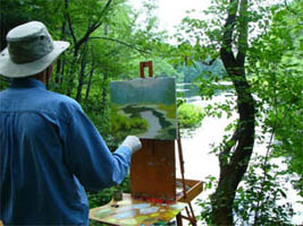 Charles River Watershed Association (CRWA) is a non-profit environmental organization founded in 1965 to restore one of the earliest settled rivers in America. Its work is to protect all 80 miles of the Charles River as well as its watershed, which drains an area of 308 square miles, encompassing a total of 35 towns. Almost a million people, 16% of the state population, are directly impact and are impacted by the health of the Charles River. 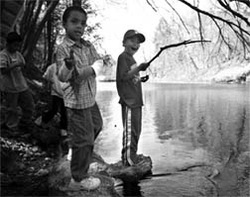 CRWA has played a prominent role in cleaning up the river and has influenced government policy, developed river water monitoring protocols, fought to uphold water use rulings, studied and protected river plants and wildlife, and educated public officials, community groups, students of all ages and legislators on best practices in protecting watersheds. Today, CRWA is the leading organization in helping the public understand the river's current health and the sources of pollution contributing to its impairment for both recreational use and as habitat for fish and wildlife. CRWA assists cities and developers realize new possibilities in urban planning through thoughtful consideration for preserving and protecting water resources, and through engineering that conforms to natural hydrology. Fall 2007: Who Lives in Your Backyard? The Audubon Ark outreach program from Massachusetts Audubon's Drumlin Farm presented a live animal demonstration entitled "Who Lives in Your Backyard?" As Audubon Ark's naturalist introduced a hawk, an opossum, a painted turtle, and a box turtle, the audience had the opportunity to meet native animals and discover the relationship between where they live and what they look like. All the wildlife presented is native to our backyards. The program cultivated an appreciation for and an understanding of native animals and their habitat. Young children developed an awareness and understanding of our interrelationship with the land that sustains and surrounds us. All these native animals are cared for in Drumlin Farm Sanctuary. They live in captivity because of injuries that make it impossible for them to survive on their own. Spring 2007: Sustainable Design: Why and How? Co-sponsored by the Natural Resources Commission, SMART Wellesley (Sustainable Management of Appropriate Resources and Technology) and Green Waves. Sustainable design in your home saves energy and protects health. For these same reasons, municipalities, states and the federal government have adopted policies around sustainable design and construction. Colleges and universities, non-profit organizations, and corporations also have sustainable policies that govern how they build and operate buildings. Why is sustainable design important, even imperative? In this program, Barbra Batshalom from The Green Roundtable discussed ways that green residential design can make a difference by reducing energy costs and increasing quality of life. 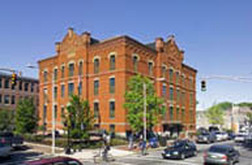 Bill Hammer and Eric Kluz (HKT Architects) presented case studies of green municipal buildings in Boston, Cambridge, and Lexington, as well as the green Doyle Conservation Center in Leominster built for The Trustees of Reservations. HKT Architects is a planning and architecture firm specializing in sustainable design for municipalities and state agencies, educational institutions, and non-profit conservation and cultural organizations. The Green Roundtable is a non-profit organization whose mission is to mainstream sustainable development through strategic programs in education, policy and technical assistance. The audience met live animals native to the Wellesley area, investigated their habitats, explored their amazing adaptations, and discovered how these animals relate to conservation. Tabitha brought two live animals with her; one was an endangered species. There there were also “touch” items such as fur and other exhibits for children to look at after the program. Tabitha Hobbs works as a Teacher Naturalist for the Blue Hills Trailside Museum. She graduated from UMass Amherst in 2004 with a degree in Natural Resource Studies and a minor in Education and Wildlife Conservation. She enjoys hobbies such as kayaking, photography, and identifying dragonfliesin which she can continue to learn and be outside. The Blue Hills Trailside Museum is a small natural history museum with native non-releasable wildlife situated at the base of the Great Blue Hill in Milton, MA . 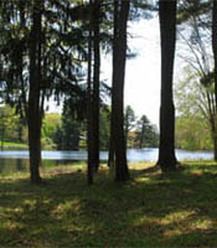 It is owned by the Department of Conservation and Recreation and managed by Mass Audubon. The Blue Hills Reservation is the largest open space within 35 miles of Boston, encompassing over 7000 acres. Hiking, biking, horseback riding, and boating are just some of the activities available to the public at the reservation. Naturalist and author Peter Alden presented a dynamic discussion of the many factors affecting the wildlife of Wellesley and the surrounding towns. An entertaining and informative speaker, Mr. Alden and has led over 250 ecotours in over a hundred countries. He lectures all over the world for travel and museum organizations. Maintaining a balance with wildlife in our densely-populated suburban towns is a juggling act, as the deer population, odoriferous skunks, over-wintering geese, and many other critters all press for space in the face of habitat loss. The arrival of new species is also changing the character of our surroundings. Will exotic invasive plants from far away places overwhelm our gardens and woodlands? Mr. Alden explained which exotic plants are taking over and how birds and insects play a role in both their proliferation, and at the same time, suffer from the consequences. Mr. Alden is the founder of the Biodiversity Days movement. In 1998, at the first Biodiversity Day held in Concord and Lincoln, in one day almost 2,000 species were identified by a team of 100 expert scientists. He also spearheaded the first statewide Biodiversity Days where citizen naturalists in over 80 Massachusetts towns went into the field to do a species census. This information was a valuable and interesting snapshot of both the common and the unusual species found across Massachusetts. Mr. Alden is the author of over a dozen nature field guides including the National Audubon Society Field Guide to New England. This book is a guide for identifying 1,000 of our region's wildflowers, trees, mushrooms, mosses, fishes, amphibians, reptiles, birds and much more. He also provides an extensive overview of the area's geology, weather patterns and natural sites. Fall 2005: Why Should You Care about Bats? Dr. Thomas Kunz, Professor of Biology and Director of the Center for Ecology and Conservation Biology at Boston University, as well as a noted bat expert, described the importance of bats in the world's ecosystem. Dr. Kunz presented a brief overview of bat characteristics including what distinguishes bats from other mammals, what different species look like, how many kinds of bats are known in the World, where they live, what they eat, as well as their importance to both the natural and human-altered ecosystems. He spoke about the feeding and roosting habits of selected bat species including tent-making bats, cave-roosting bats and hibernating bats. Myths about bats are found in many cultures, in movies, comic books and on television. Dr. Kunz talked about some of the common myths and folklore about bats, how bats are being threatened by human activities, and why it is important to protect and preserve bats and the habitats on which they depend. He brought a live bat and demonstrated some of the special equipment he uses to study bats in hollow trees and caves. 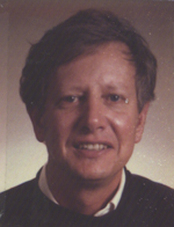 Dr. Kunz has been on the faculty of Boston University for the past 34 years. His research focuses on the ecology, behavior, evolution and conservation biology of bats. He is the author or co-author of over 200 publications and is the editor of Ecology of Bats (Plenum Press, 1982) and co-editor of Bat Biology and Conservation (Smithsonian Institution Press, 1998) and Functional and Evolutionary Ecology of Bats (Oxford University Press, in press). He is an elected Fellow of the American Association for the Advancement of Science, past president of the American Society of Mammologists and a recipient of the Gerrit S. Miller Jr. Award and the C. Hart Merriam Award. He is currently funded by grants from the National Science Foundation and the National Park Service, where his research focuses on assessing the ecological and economic impact of Brazilian free-tailed bats on agro-ecosystems and the influence of environmental factors on the prevalence of rabies infections in two species of North American insectivorous bats. He has pioneered the applications of infrared thermal imaging in ecology and behavior.